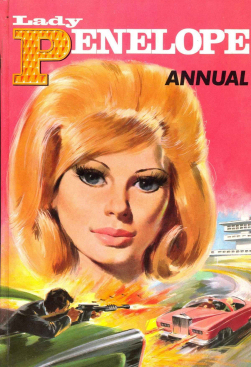 DENIS GIFFORD (26 December 1927 – 18 May 2000) was a British writer, broadcaster, journalist, comic artist and historian of film, comics, television and radio. 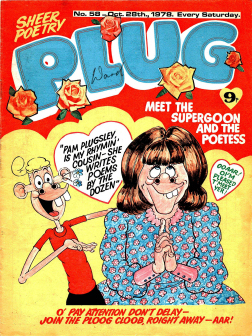 In his lengthy career, he wrote and drew for British comics; wrote more than fifty books on the creators, performers, characters and history of popular media; devised, compiled and contributed to popular programmes for radio and television; and directed several short films. Gifford was also a major comics collector, owning what was perhaps the largest collection of British comics in the world. 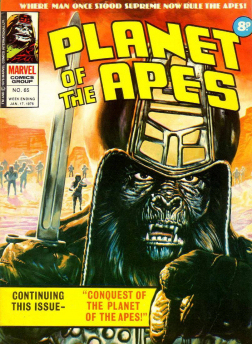 Gifford’s work in the history of film and comics, particularly in Britain, provided an account of the work in those media of previously unattempted scope, discovering countless lost films and titles and identifying numerous uncredited creators. 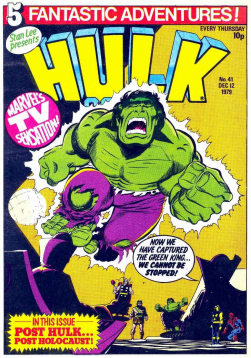 He was particularly interested in the early stages in film and comics history, for which records were scarce and unreliable, and his own vast collection was an invaluable source. Gifford produced detailed filmographies of every traceable fiction, non-fiction and animated film ever released in the UK, and of early animated films in the US. 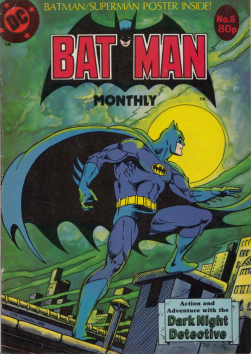 He compiled the first comics catalogue attempting to list every comic ever published in the UK, as well as the first price guide for British comics. His research into the early development of comics and cinema laid the groundwork for their academic study, and his reference works remain key texts in the fields. Gifford was also a cartoonist and comic artist who worked for numerous titles, mostly for British comics in the 1940s, 50s and 60s. 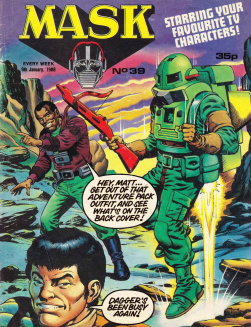 Although these were largely humour strips, he worked in a range of genres including superhero, Western, science fiction and adventure. Gifford was born in Forest Hill, London, the only son of William Gifford, a printer, and Amelia née Hutchings. He grew up in the prosperous South London suburb of Sydenham, but was evacuated during the war to Tonbridge, Kent. Gifford attended the South London private school Dulwich College (1939–44), and while a pupil there was an avid comic collector and cartoonist. 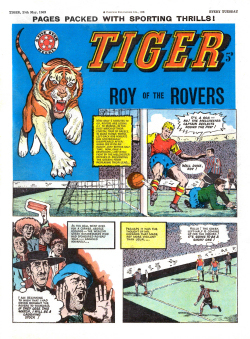 He produced a comic, The Junior, using heated gelatine and hectograph ink, which he sold for 1d around the school, but had published comics art by the time he was 14 (1942). 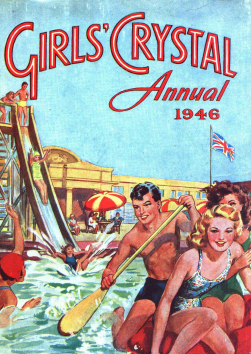 Gifford became friends with Bob Monkhouse, a Dulwich schoolmate, fellow schoolboy cartoonist and later TV comedian and presenter, who studied in the year below and also had cartoons published while at the school. 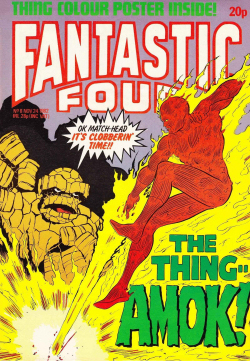 Gifford and Monkhouse collaborated on comics writing and drawing, a partnership that was to continue for many years in various forms, including as radio scriptwriters. The two toured together as a comedy act in the south east of England in the late 1940s with Ernie Lower’s West Bees Concert Party, giving charity performances with Monkhouse as the ‘straight man’. Gifford continued drawing during National Service in the Royal Air Force (1946-8), in which he served in the clerical position of ‘AC1 Clerk/Pay Accounts’, and went on to draw the Telestrip cartoon for the London Evening News. Gifford’s prolific career as a cartoonist included both newspaper strips and comics, almost entirely for British publishers. 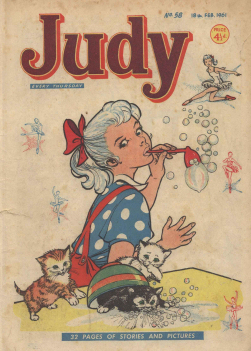 His first published work was Magical Monty for All-Fun Comics (1942) at the age of 14, with a contribution to The Dandy the same year, and briefly worked as junior cartoonist for the newspaper Reynold’s News (1944–45). 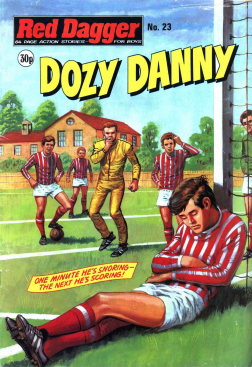 He collaborated on comics writing and drawing with school friend Bob Monkhouse while they were still pupils at Dulwich College together. 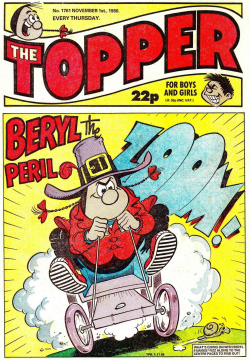 After his National Service, Gifford drew the Telestrip cartoon for the London Evening News, continuing in Rex magazine (1971–72), and on bubblegum and cigarette sweet packets. Other newspaper strips were produced by Gifford for Empire State News and Sunday Dispatch. 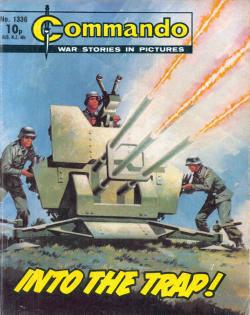 Gifford’s early work was with D.C. Thomson and the majority of his work was for humour strips, but he went on to cover various genres and styles, including adventure, detective, science fiction, Western and superheroes. 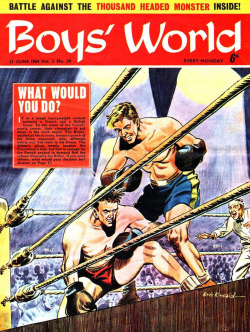 Gifford was most productive as a comics artist in the 1940s, 50s and 60s. 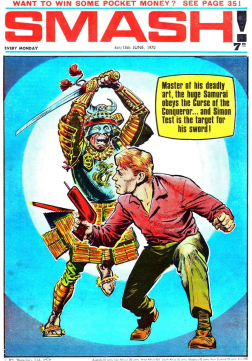 By the early 1970s Gifford’s writing career, mainly on the subjects of comics and film history, began to take over from his work as a cartoonist in his own right. 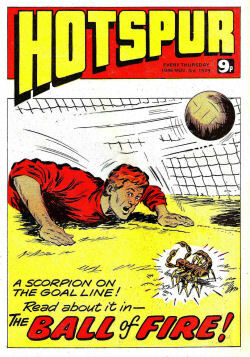 Gifford had a distinctive, simple drawing style with a light-heartedness evident even in more action-orientated strips. Panels were often bustling and dynamic, with individual characters vying for attention. 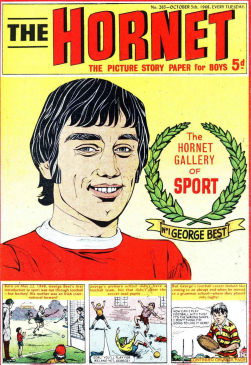 His humours strips were dense with conspicuously labelled puns and ‘sight gags’, the “visual conventions” of comic art, informed by an intense awareness of the cultural heritage of the medium. 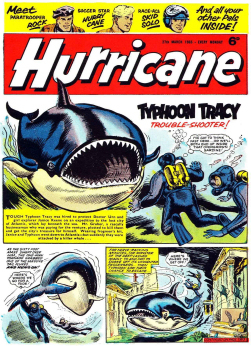 In the period Gifford drew for them, D.C. Thomson and most British comic publishers had a strict policy that artists could not sign their work but exceptionally, he was allowed to clearly sign his art. 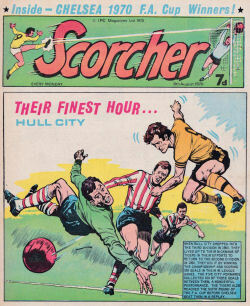 Gifford created at least three of the earliest British Golden Age superheroes, Mr Muscle for Dynamic Comics (1945), Streamline, whose #1 tagline proclaimed him “The speediest fighter in the world”, co-created with Monkhouse for Streamline Comics (1947) and Tiger-Man, debuting in Ray Regan #1 (1949). 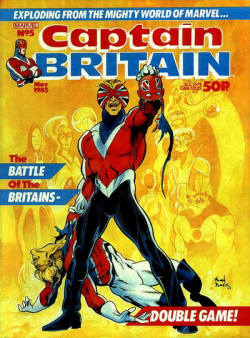 Gifford himself credits “the first British superhero in the American comic book style” to Derickson Dene by Nat Brand in British anthology comic The Triumph in 1939, but both Mr Muscle and Streamline were early attempts to introduce British characters in a characteristically American genre, prompted by severely limited imports or reprints of US superhero titles due to wartime paper rationing and import restrictions. 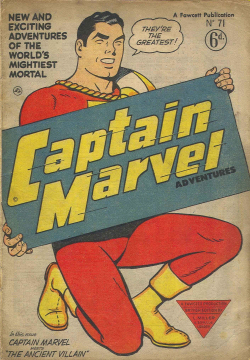 Gifford and Monkhouse set up their own publishing company, Streamline, in the early 1950s which published reprints of other Golden Age superheroes such as Captain Might and Masterman. Only Streamline Comics #1 had story and art by Gifford, although he contributed the one-page humour strip Inky the Imp of the Inkpot and the adventure strip Search for the Secret City in #4. Mr Muscle should not to be confused with the later DC character Mister Muscle of Hero Hotline, created by Bob Rozakis, or the Charlton Comics character Mr. Muscles, created by Jerry Siegel. Tiger-Man should not be confused with Tiger Man, the Street & Smith Golden Age hero, Tigerman, the Fiction House Golden Age hero, or Tiger-Man, the Atlas/ Seaboard character. 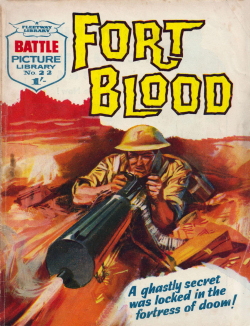 Gifford created, wrote and edited several comics in the 1940s and 1950s. 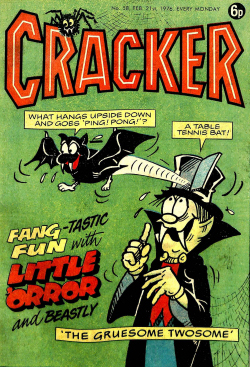 These included detective title Ray Regan (1949), with art by Ron Embleton, the pantomime-themed Panto Pranks (1949), which Gifford wrote and drew, Fizz Comics (1949) and Star Comics (1954), which he drew and edited with Monkhouse, featuring strips of contemporary entertainers Morecambe and Wise, Bob Monkhouse himself, Jill Day and movie character Tobor The Great. 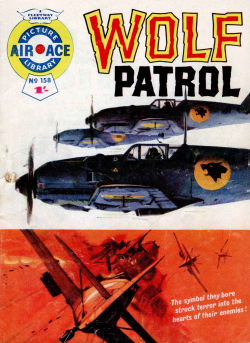 These titles created by Gifford often ran for just a single issue, to take advantage of a loophole in postwar paper rationing, but the succession of short projects suited Gifford’s diverse interests as it enabled him to flit from genre to genre. 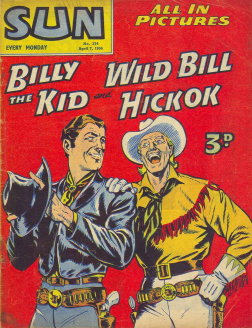 Gifford drew and often wrote a number of Western comics strips in the 1940s, 50s and 60s, including ‘Ace High’ Rogers versus Redmask (1946), Bill Elliott in Republic’s Old Los Angeles in The Sheriff #3 (1948) and strips for Annie Oakley (1957–58) and Gunhawks Western (1960–61). Gifford provided art for movie adaptation strip Roy Rogers in Western comic The Sheriff Comics (no date, 1950s), signing himself ‘Gus Denis Gifford’ and offering a drawing style [in which] “[h]is likenesses could approach very close to the American ones produced by Harry Parks”, consistent with Gifford’s busy, comical style in other genres. 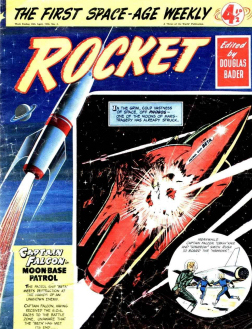 Gifford and Monkhouse contributed cartoon strips to various magazines in the 1940s and 1950s, including Galaxy magazine (1946) (not to be confused with Galaxy Science Fiction). Gifford drew the cover for Classics Illustrated #146 (British series), Adventures of Baron Munchausen (1962), a more comedic and cartoon-like rendering than was conventional for the title’s covers, which tended to be classically heroic and often painted. Gifford went on to produce several strips for the highly popular humour comic Knockout, including Our Ernie (1950), Stoneage Kit the Ancient Brit and his own creation, the gags and puzzles strip Steadfact McStaunch. 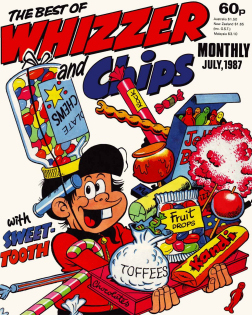 He later revived Steadfast McStaunch for a run in IPC’s new title Whizzer and Chips (1969), which itself merged with Knockout in 1973. 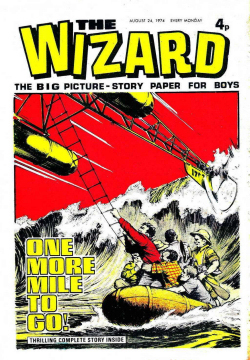 After working with Mick Anglo on the ABC science-fiction title Space Comics (1953–54), Gifford began work for Anglo Studios when it was set up in 1954, including a long stint writing and illustrating early Marvelman, the superhero reinvented in the 1980s with a darker vision by Alan Moore. 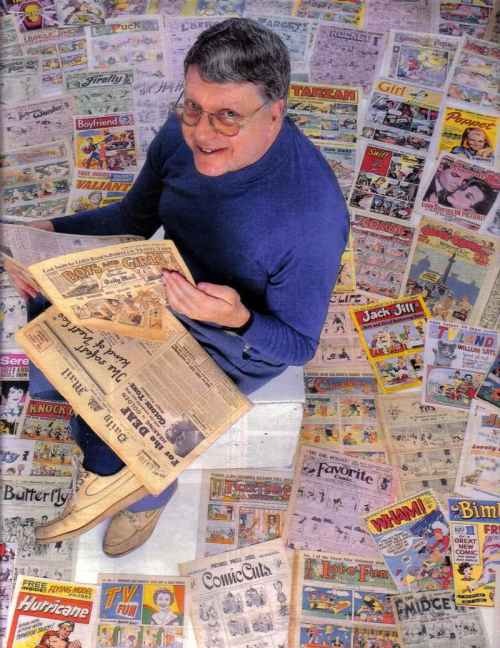 Gifford worked on a number of strips in several titles in the Marvelman stable, and created the light-hearted backup features Flip and Flop and The Friendly Soul. He also wrote an editorial piece, Founding a Family, on the history of Marvelman Family for a 1988 reprint of the strip in Miracleman Family #2. When Anglo took on US reprint series Annie Oakley, Gifford was one of the staff of British and Spanish artists used to create new strips (1957–58). 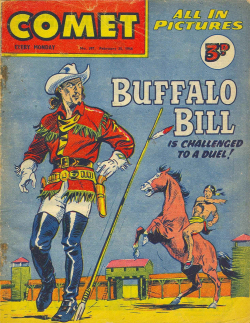 Gifford went on to provide Western strips for Anglo Features title Gunhawks Western (1960–61) and humour strip Our Lad for Anglo’s Captain Miracle (1961) contributed several humour strips for Anglo’s anthology of Silver Age DC reprints, Super DC (1969–70), as well as reprints of his humour strip The Friendly Soul from Marvelman in Superman Bumper Book (1970) and Super DC Bumper Book #1 (1971). 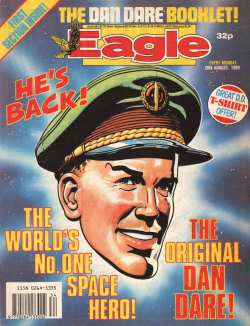 Later in the 1960s, Gifford also produced the one-off News of the Universe Television Service and regular humour strips Dan Dan the TV Man and the collection of one or two-panel gags, Jester Moment for TV Tornado (1967–68) where Mick Anglo was editor. Although Gifford did not have an academic background, he was an acknowledged authority on film history who is respected by academics in film studies, media studies and social and cultural history. Much of his reference work is recommended reading in these disciplines. Along with several other pioneering film archivists, Gifford’s ‘encyclopaedic work’ was recognised by the Institute of Historical Research as having “provided thoroughgoing maps of British film personnel and production histories”. Gifford compiled a comprehensive reference work of British-made films, The British Film Catalogue, 1895-1970: A Reference Guide, listing every traceable film made in the UK, including short films generally omitted by film catalogues, with detailed entries including running time, certificate, reissue date, distributor, production company, producer, director, main cast, genre and plot summary. It was a labour of many years, as Gifford tracked down retired industry professionals and researched back issues of trade publications, fanzines and directories. 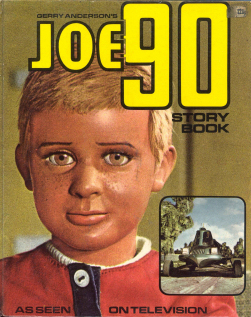 The Catalogue’s third (1994) edition revised all entries and was published in two volumes, The Fiction Film, 1895–1994 and The Non-Fiction Film, 1888–1994. It became a seminal work for British film historians, acclaimed by The British Film Institute (BFI)’s curator of Moving Image in a Sight & Sound magazine shortlist of the best ever film books: “The nearest we have to a British national filmography was created not by any institute or university but by one man.” Gifford’s popular work A Pictorial History of Horror also made the shortlist. Gifford’s writing also included biographies of cinematic figures, including Karloff: The Man, The Monster, The Movies and The Movie Makers: Chaplin, with his meticulous research and detailed knowledge well suited to the form. Gifford was a judge at the Sitges 1977 International Festival of Fantasy and Horror. As well as vintage comedy, Gifford had a particular interest in genre films, favouring the origins of those genres and the lower-budget B-movie output. 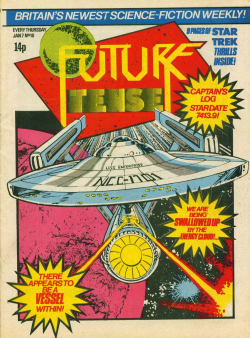 He had written for science fiction fanzines since the 1950s, which he regarded as the period in which the genre gained maturity in the cinema: “it was the 1950s before sci-fi really got started, first with George Pal’s astounding semi-documentary Destination Moon pipped at cinematic post by Robert L. Lipert’s B-movie Rocketship X-M. Where the cinema led, comics followed.” He had attempted to spur early science fiction ‘fandom’ with his 1952 Space Patrol Official Handbook, an introduction to science fiction that included an index of ‘films of future fantasy’ from the 1902 French ‘trick’ film A Trip to the Moon by Georges Méliès and the 1918 Danish A Trip to Mars up to contemporary films such as the 1951 The Day the Earth Stood Still, screen shots from recent science fiction films The Man From Planet X, Rocketship X-M, The Day the Earth Stood Still and When Worlds Collide. Astronomical facts and diagrams of imagined spacecraft and spacesuit, drawn by Gifford, were also included. Horror held a special fascination for Gifford: he was an active figure in horror fandom of the 1950s, 60s and 70s, including the Gothique Film Society, and in the 1970s he had regular columns in Dez Skinn’s House of Hammer magazine, first a serialised Golden History of Horror and later History of Hammer. However, Gifford had been deeply critical of Hammer Studios, especially the productions of its later years, preferring the more understated examples of early British and Hollywood horror. 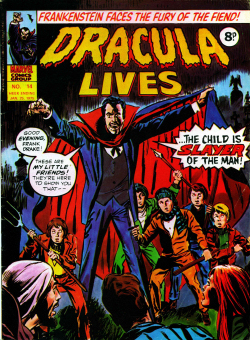 He found Hammer’s relatively explicit use of blood-letting and sexuality to be cynically exploitative, noting in his 1973 A Pictorial History of Horror that “The new age of horror was geared to a new taste. Where the old films had quickly cut away from the sight of blood, Hammer cut in for a closeup.” A Pictorial History of Horror was an influential work for a generation of film and horror enthusiasts, described in The Paris Review by author and journalist Dave Tompkins as “the most important book of my childhood”. Gifford was a lifelong fan of Laurel and Hardy, and founded ‘Film Funsters’, the first British branch of the Laurel & Hardy Appreciation Society, as well as writing several articles on the duo. He was also a keen Sherlock Holmes enthusiast, and was a member of the Sherlock Holmes Society and wrote various reviews and articles on films featuring the detective. Gifford wrote numerous articles on film and popular entertainment, both professionally and for fanzines. Although a highly respected film historian, Gifford’s professional involvement in cinema was relatively limited. However, in the 1950s and 1960s he directed and photographed a number of short films, most of which were publicity and public information films commissioned by the British Government. He also produced and directed the Pathe newsreel Highlight: The Singing Cinema (1964), a compilation of extracts from British musical films from 1929–64. While at Pathe, Gifford married Angela Kalagias, a fellow Pathé employee. The couple, who later divorced, had one daughter, Pandora Jane, born in 1965. Gifford scripted the Space Race spoof Carry on Spaceman in 1962, but although scheduled the film was not shot. 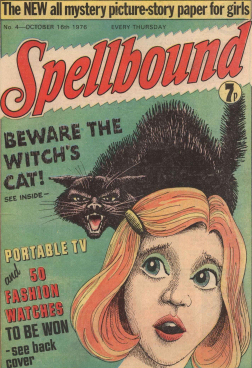 Gifford was regarded by many as the UK’s pre-eminent comics historian, particularly of early British comics. 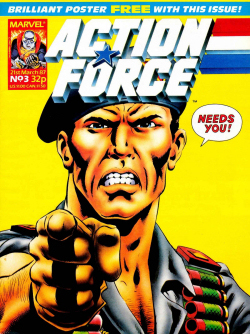 The British Library provides catalogues and reference works written by Gifford as assistance to researchers of its British Comics Collection, and indeed most of the reference works on the subject provided by the British Library were written by Gifford. 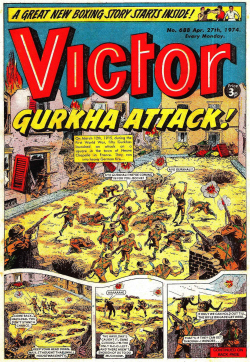 Gifford provided the first reliable, detailed account of early comics in works such as Victorian Comics (1976) and The British Comics Catalogue, 1874–1974 (1974), with a detailed overview in his International Book of Comics (1984). He also advanced debate on the origins of comics, including what the first comic and comic characters were, arguing that “there is no point [in the history of comics] where we can pick up a paper and declare it Comic Number One.” He identified the first comedic narrative periodical, as an antecedent to the comic as The Comick Magazine (1796) which although all text included a single William Hogarth print per issue, which Gifford suggested when combined formed a “narrative sequence … [so that] they could be described as an early form of comic strip.” Gifford identified the significant stage of “the first continuing cartoon hero” as Rowlandson’s Dr Syntax in the serial The Schoolmaster’s Tour in The Poetical Magazine (1 May 1809). 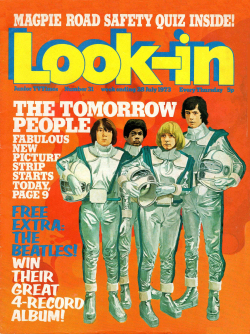 He argued that “in Europe, perhaps the world” the first caricature magazine, an important prototypical form of the comic, was Hopkirk’s The Glasgow Looking Glass (11 June 1825). Gifford located the origin of the modern graphic narrative in the late nineteenth century, tracing development through various stages that included Judy – The London Serio-Comic Journal (1 May 1867) featuring Ally Sloper, the first recurring character in a text and picture serial. He observed in Victorian Comics that Sloper “was the first to appear in comic book format … a paperback reprint collection … the first to have his own comic paper … and was the longest lived [character] in comic history.” He suggested a key contender as the first comic as being the paper Funny Folks (12 December 1874), which had an unprecedented half-picture, half-text per page layout. 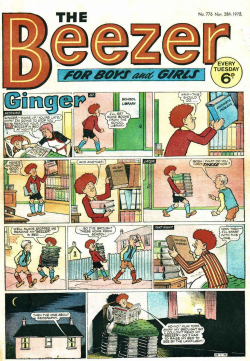 Sloper’s debut was certainly a series of panels, but it lacks “interdependence as a sequential narrative strategy” with images each relaying a single joke without forming a narrative with other panels, and it lacked some key features of the form, such as the speech bubble, while it had accompanying text for each image. Debate continues, but Gifford’s research and conclusions into the origins of comics as a medium have gained considerable academic acceptance. 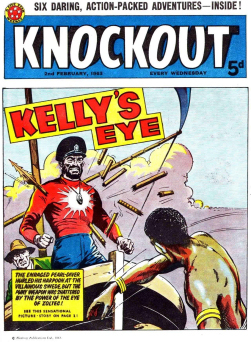 Ally Sloper was championed by Gifford as the world’s first ever comic character, and became a totemic figure for him, being revived and sometimes drawn by him in a number of comics and other publications that sought to ensure a modern readership had an awareness of early comic history. 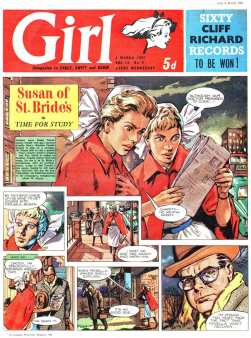 The Ally Sloper magazine was not a commercial success and lasted only four issues, but the innovation of Gifford’s tone in the title was acknowledged by one cultural historian as “[w]ith his accurate spoof of the style of traditional British humour comics … anticipat[ing] Viz by nearly three years.” He produced artwork for advertisements for an Ally Sloper T-shirt, which was published in several Alan Class Comics titles in 1976, to promote the Ally Sloper magazine. 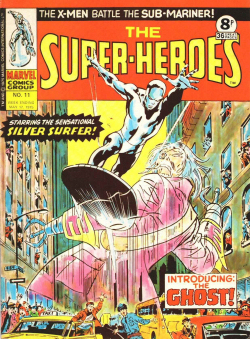 Gifford also initiated the Ally Sloper Awards in 1976, an annual prize for veteran comic artists. At a summit on comics history convened by the 1989 Lucca Comics Festival in Italy, Gifford was invited to be one of the eleven ‘international specialists’ to sign a declaration that The Yellow Kid was the first comic character having been first published in 1895. Gifford signed, but pointedly did so in the name of Ally Sloper, first published in 1867. 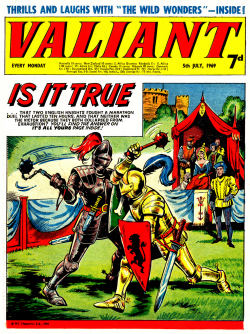 Gifford sought to draw a distinct definition for British comics history, as the Golden Age and other historical eras of comics were first defined to describe US comics history. 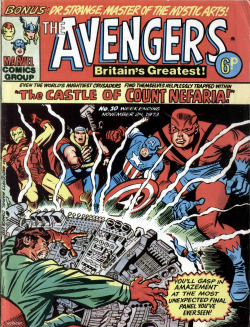 These eras relate to UK comics only as a result of American influence on the UK market and creators, and do not acknowledge key differences in British comics of the period, notably the preponderance in Britain of humorous anthologies rather than the genre titles, most especially superheroes, that predominated in the US. 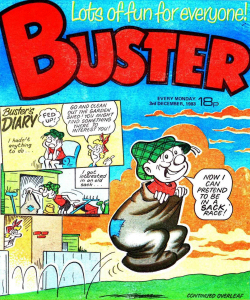 Gifford observed that the “Thirties were the Golden Age of British comics” due to the profusion of successful, high quality and specifically British humour comics beginning in the 1930s, including D.C. Thomson’s The Dandy (4 December 1937), The Beano (30 July 1938) and Magic (22 July 1939) and Amalgamated Press’s Jingles (1934), Jolly (1935), Golden (23 October 1937), Radio Fun (15 October 1938), Happy Days (8 October 1938) and Knockout (4 March 1939). The start of the Second World War in 1939, and the resulting paper shortages, marked the end of many of the titles, a definable end to the era and the beginning of what Gifford termed the “Dark Age”. Gifford’s The British Comics Catalogue, 1874–1974 (1974) was the first comprehensive index of British comics, and his later British Comics, Story Papers, Picture Libraries, Girls Papers, American Reprints, Facsmilies, Giveaways Price Guide (1982) the first attempt to offer a price guide for British comics (US comic books had been covered by The Overstreet Comic Book Price Guide since 1970). 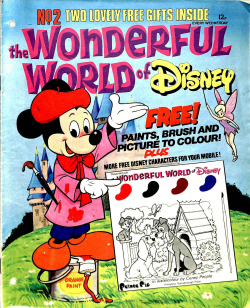 It was the antecedent of works such as the Official Comic Book Price Guide for Great Britain (1989). 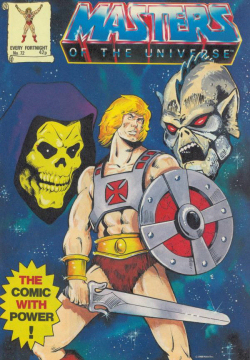 Gifford had a particular interest in children’s comics. 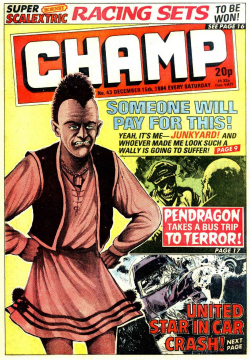 Although his collection included 1960s underground comics, the alternative comics of the 1970s as well as the more experimental mainstream of comics’ Modern Age, he was not initially convinced by changing conceptions of comics as a medium suited to addressing adult themes such as sexuality, violence and storytelling techniques influenced by literary fiction, cinema and art. 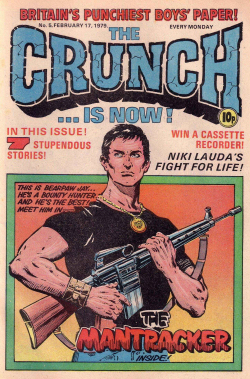 He recognised that the growth in adult readership of comics since the 1970s was due to nostalgia, but did not foresee the potential for a development of the medium. “And nostalgia is escape. 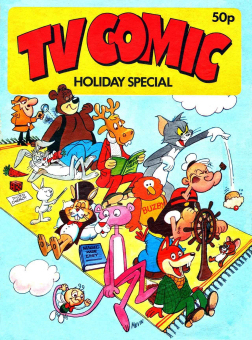 The comics – the best of them – represent wholesome innocence, a marvelous sense of fun and a pointer to current times perhaps, the triumphant overcoming of all sorts of difficulties.” When children’s comics began to reflect changes in cinema and mass culture, he was unafraid to speak out, even where this might involve constraints on the comics industry and creators. 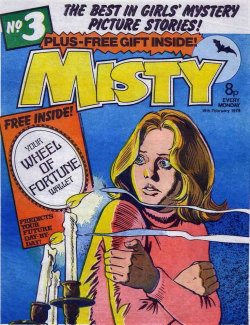 However, Gifford’s concerns were limited to comics intended for children and adolescents, and he was well aware of a development of the medium for an adult audience. He collected and was able to appreciate the content of underground and Modern Age comics, offering sophisticated and sometimes sympathetic analysis. 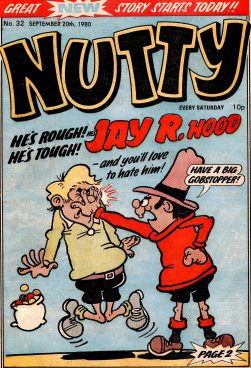 Gifford’s own Ally Sloper comic (1976) offered a combination of vintage and alternative strips for an adult audience, although the nostalgic strips were his primary interest. Gifford’s work The Golden Age of Radio was the first reference guide to programmes, broadcasters and catchphrases of radio of the 1930s and 1940s, and remains an important source for researchers in radio history. Gifford was working on a filmography and history of 1930s British television, but died before its completion. Gifford wrote extensively for comedy and light entertainment in both television and radio, his work often reflecting his fascinations of radio and film nostalgia and cartoon art. Gifford wrote the first television series of comedy stars Morecambe and Wise, Running Wild (1954), having been brought in with fellow cartoonist, comic enthusiast and film buff Tony Hawes to save a series which was initially panned by critics. He also provided material for the opening night of ITV (1955) and co-wrote the first comedy show to be screened by BBC2, the TV movie Alberts’ Channel Too (1964) for the launch of the channel, although the whole evening’s broadcasting was lost due to a power blackout. 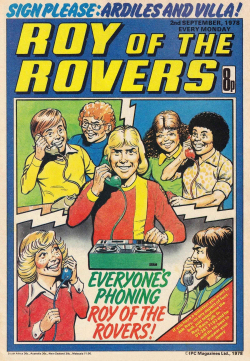 He wrote for Junior Showtime (1973), devised the nostalgia panel show Looks Familiar (1970–87) for Thames TV, presented by Denis Norden, its radio counterpart Sounds Familiar and the Thames quiz show Quick on the Draw (1974–1979) featuring drawings by cartoonists and celebrities, with presenters including Bob Monkhouse, Rolf Harris and Bill Tidy. He also wrote scripts for the ITV children’s puppet shows Witches’ Brew (1973) and The Laughing Policeman (1974). 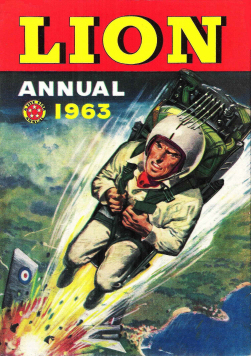 Gifford also designed stunts for the popular BBC1 game show The Generation Game. The scriptwriting partnership with Hawes began in radio, for weekly BBC concert party The Light Optimists (1953) and continued with stunt devising for the US-bought game show People Are Funny for Radio Luxembourg. A broadcaster in his own right, Gifford featured in numerous television and radio programmes as an expert in the history of film, radio and comics, as well as appearances in a variety of documentary and news magazine programmes over several decades. Appearances included editions of BBC’s On The Braden Beat (1964) commenting on comics, Granada’s Clapperboard (1974) and a review of forthcoming horror films for BBC1’s Film 1973 (1973), Goon but not Forgotten, a radio history of the Goon Show as part of the Laughter in the Air: The Story of Radio Comedy (1979) and twice as guest panellist for Radio 4 panel show Quote… Unquote (1985). 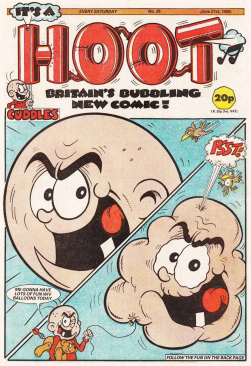 Gifford and Monkhouse reprised their partnership with BBC radio programmes on the history of the comics, Sixpence for a Superman (1999) on British comics and the two-part A Hundred Laughs for a Ha’penny (1999), a history of comic papers. 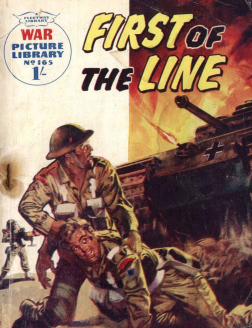 Gifford’s most valuable research resource was his own collection, as in over sixty years he had accumulated what is generally recognised as the largest comic collection in the UK and the largest collection of British comics in the world, including the only known complete runs of all comics published in the UK in the 1940s. 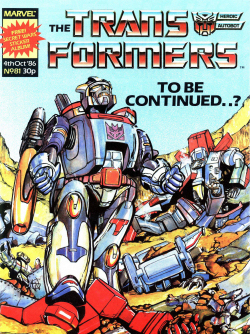 He collected the first and last issues of all comics published in the UK, as well as Christmas issues and other special editions, and also collected first issues of US comics. 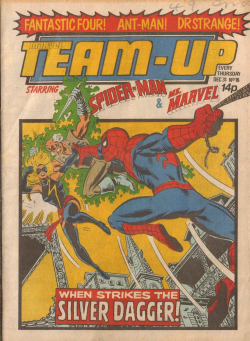 To a lesser extent, first issues of comics from other countries were also collected. 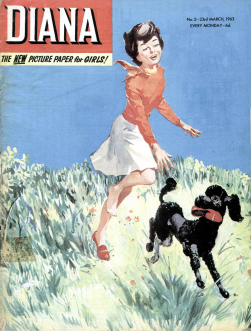 Gifford was also a collector of other ephemera, including pulp books, popular magazines, theatrical programmes, film and comic fanzines, original film scripts and sheet music, as well as pop culture memorabilia, describing himself as “the keeper of the nation’s nostalgia” and with a collection that included periodicals not to be found in the British Library. Unusually for a collector, Gifford’s interests were defined by their eclecticism, including comics, radio recordings and film from throughout the world and spanning from the origins of the media up to new releases. 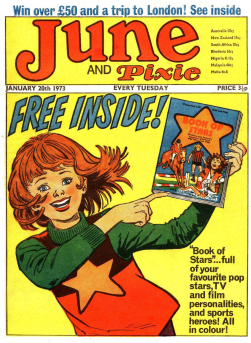 His own ‘biog’ for a 1975 book calculates his collection “extends to some 20,000 issues” but is careful to limit the estimate to the particularly British form of ‘comic papers’ which excluded his vast collection of American comic books, and in any case accumulated many more in the next 25 years of his life. He had certain specific interests, notably British horror films of the 1930s to the 1960s, early cinema and radio, Laurel and Hardy movies and memorabilia, British comic papers of the late nineteenth century and British and US comics of the 1920s, 1930s and 1940s, especially those which featured personalities from contemporary radio. However, the parameters of his interests and collection broadened substantially throughout his life. Gifford’s collection had suffered an early setback, an anecdote related by Bob Monkhouse: “You cannot begin to imagine his grief when he completed his National Service to return home to find that his mother had thrown away his huge collection of Film Fun, The Joker, Merry and Bright and a dozen other titles … Denis was to spend the rest of his life trying to replace those lost copies.” Gifford’s mother was later to express deep regret at their destruction. 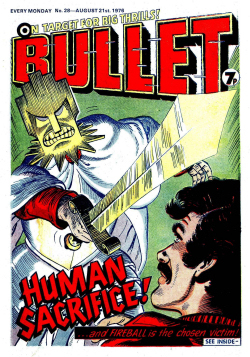 Gifford’s collection was the product of his lifelong passion for comics and popular culture, and his highly prolific research work was an attempt to provide a comprehensive history of the ephemeral. 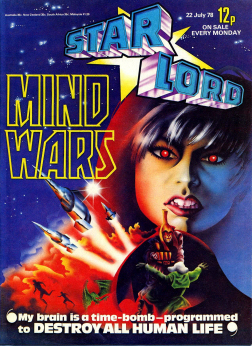 Particularly in the early decades of his writing on the subject, pop culture drew little attention from academic research and Gifford was particularly passionate about the most obscure examples of vintage comics, film, television and radio, and determined that they should be recognised, chronicled and remembered before extant copies were lost. 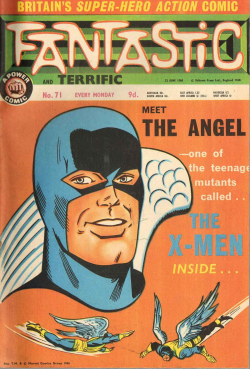 Gifford was a pivotal figure in the development of comics “fandom” in the UK, first through his writing and publishing of early fanzines in the 1950s. 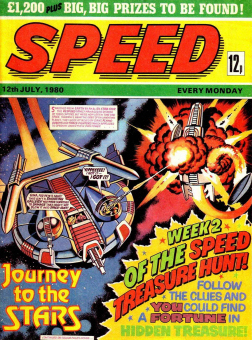 In the 1970s he helped introduce comics conventions to the UK, events where creators and industry figures could meet and respond to comics fans. 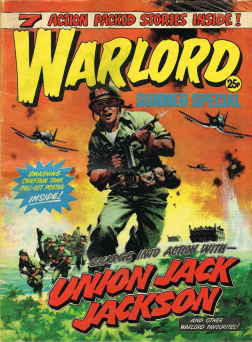 It was a significant progression of the already established comics marts where comics were simply sold, and in which Gifford was a key figure, providing the introductory presentation at the Comic Mart Summer Special 1974 and other UK events. 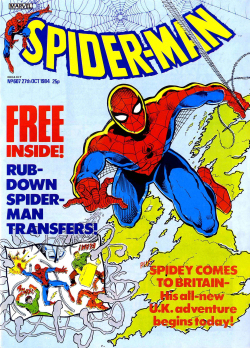 In 1974 he was the only comics industry guest at an early meeting of Britain’s major comics convention, Comicon 74. Gifford organised Comics 101 in 1976, the first convention dedicated to British comic creators, with guests including celebrated figures in British comics including Frank Hampson, Leo Baxendale, Frank Bellamy and Ron Embleton, Marvelman creator Mick Anglo and Garth creator Steve Dowling, Gifford conducting an on-stage interview with Dowling. The name of the convention was a reference to the 101 years since the first issue of Funny Folks (1874) which Gifford regarded as the first comic. 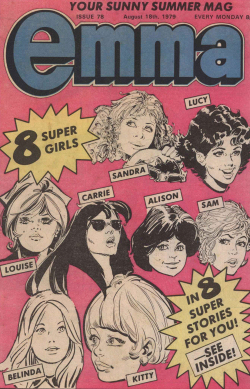 In 1977 Gifford co-founded the Society of Strip Illustration, a network for all those involved in any stage of the creative process of comics production which later became the Comic Creators Guild. 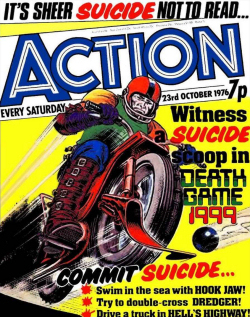 In 1978 he established the Association of Comics Enthusiasts, whose newsletter Comic Cuts ran for 14 years proper and, as a section of UK comics fanzine The Illustrated Comics Journal, until his death. 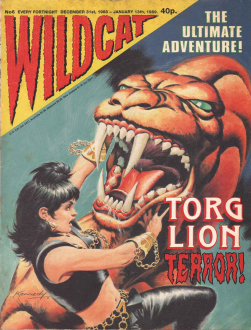 Gifford also wrote extensively for comics magazines and fanzines, particularly Comic Cuts, and it was here that he wrote some of his most specialist work on comics history and criticism. Prizegiving of the first Ally Sloper Awards for comic creators also took place at Comics 101, with Bob Monkhouse presenting. 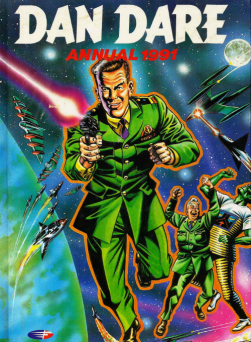 Gifford continued to organise, guest and attend comics conventions throughout the 1970s, 80s and 90s in the UK, USA and throughout Europe, including regular guest appearances the Lucca International Comics Festival, was an official guest at the first UK Comic Art Convention (UKCAC) in 1985 and was a guest speaker at the 1st UK Paperback and Pulp Bookfair in 1991. Gifford created the Ally Sloper Awards, a series of awards to recognise veteran British comics artists. The award was first presented in 1976, but no longer runs. Denis Gifford used to live at 80 Silverdale in Sydenham, south London. 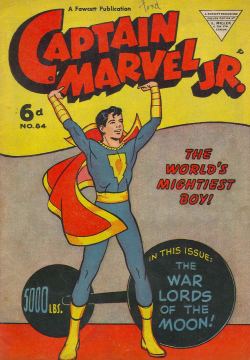 For many years, I sold American comics from 1935 to 1960 at comic conventions in London, and I know some were stolen. 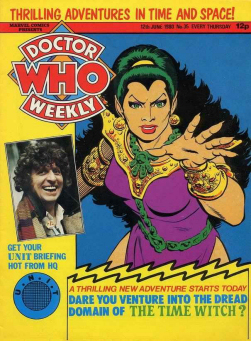 I only found out in later years that Denis Gifford had been seen stealing comics on close circuit TV but Dez Skinn (and others) thought it funny and had not thought to tell us dealers. 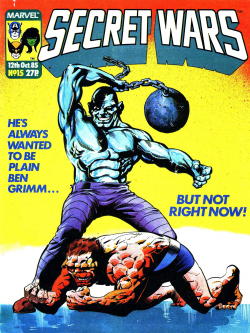 When I thought of comics that had gone missing, like a coverless Blue Bolt #1, I knew it was him that had stolen them. He would buy some cheaper items and put his case on my stall and I have no doubt that when I turned round, extra comics were put in it and the case closed. But like others, I had trusted him completely. Thanks a lot, Dez.